Hyperslab Selection : The H5S_SELECT_HYPERSLAB call selects a logically contiguous collection of points in a dataspace, or a regular pattern of points or blocks in a dataspace. Element Selection: The H5S_SELECT_ELEMENTS call selects elements in an array. Reading From or Writing to a Dataset Subset. First you must obtain the dataspace of a dataset in a file by calling H5D_GET_SPACE . Then select a subset of that dataspace by calling H5S_SELECT_HYPERSLAB. The offset, count, stride and block parameters of this API define the shape and size of the selection. They must be arrays with the same number of dimensions as the rank of the dataset's dataspace. These arrays ALL work together to define a selection. A change to one of these arrays can affect the others. offset: An array that specifies the offset of the starting element of the specified hyperslab. 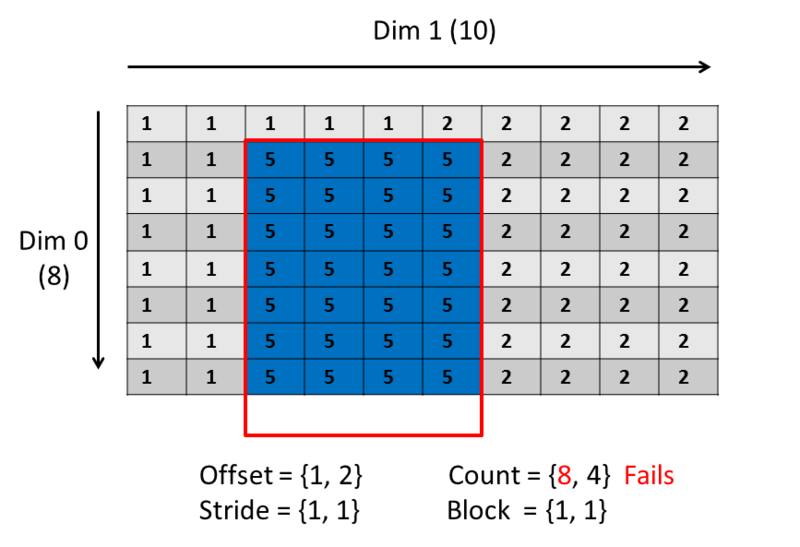 count: An array that determines how many blocks to select from the dataspace in each dimension. If the block size for a dimension is one then the count is the number of elements along that dimension. stride: An array that allows you to sample elements along a dimension. For example, a stride of one (or NULL) will select every element along a dimension, a stride of two will select every other element, and a stride of three will select an element after every two elements. block: An array that determines the size of the element block selected from a dataspace. If the block size is one or NULL then the block size is a single element in that dimension. You must select a memory dataspace in addition to a file dataspace before you can read a subset from or write a subset to a dataset. A memory dataspace can be specified by calling H5S_CREATE_SIMPLE. The memory dataspace passed to the read or write call must contain the same number of elements as the file dataspace. The number of elements in a dataspace selection can be determined with the H5S_GET_SELECT_NPOINTS API. PLEASE NOTE that the examples and images below were created using C.
*  from/to a dataset in an HDF5 file. It is used in the HDF5 Tutorial. * values to the dataset.
! This example shows how to write and read a hyperslab.
! It is used in the HDF5 Tutorial.
! Write data to the HDF5 file.
! 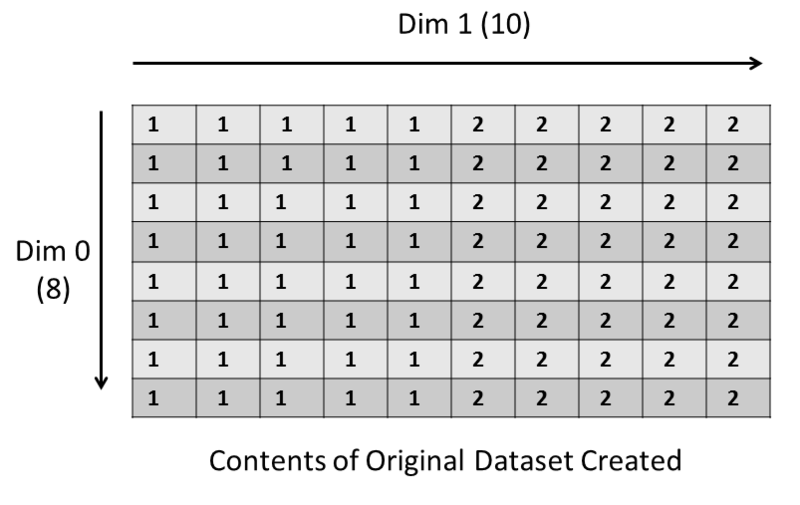 Create the data space for the  dataset.
! Create the dataset with default properties. WRITE(*,'(/,A)') "Original Data Written to File:"
! Close the dataspace, dataset, and file.
! Initialize subset data array.
! 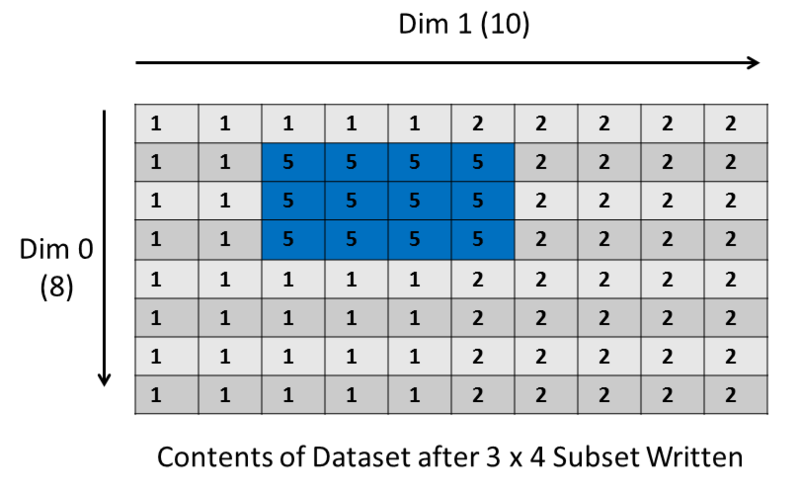 Get dataset's dataspace identifier and select subset. WRITE(*,'(/,A)') "Write subset to file specifying:"
WRITE(*,'(A,/)') "   offset=2x1 stride=1x1 count=4x3 block=1x1"
WRITE(*,'(A)') "Data in File after Subset Written:"
*  from/to a dataset in an HDF5 file. It is used in the HDF5 Tutorial. // Create a new file using the default property lists. // Then create a dataset and write data to it. // Close the file and dataset. // values to the dataset. // Specify size and shape of subset to write. // a subset from the file dataspace. // entire dataset back from the file. // be called when the object instances are going out of scope. See HDF5 Introductory Examples for the examples used in the Learning the Basics tutorial. There are examples for several other languages. Following are examples of changes that can be made to the example code provided to better understand how to make selections. 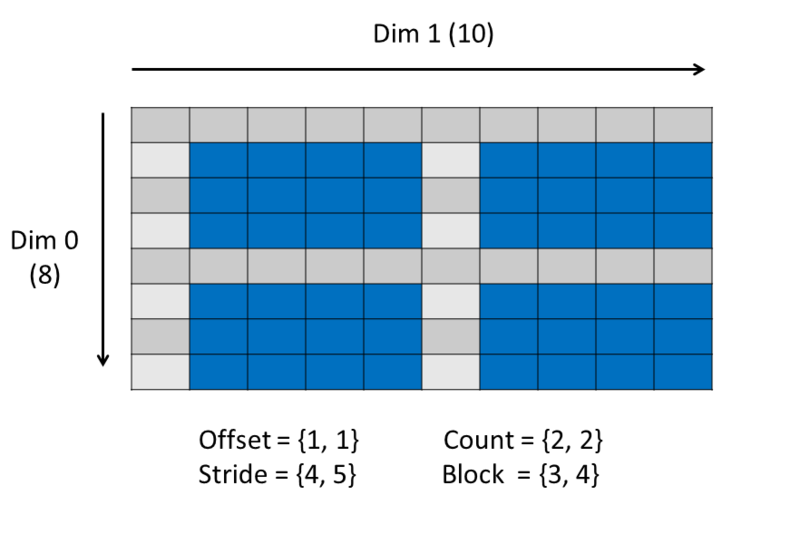 The write will fail with the error: "file selection+offset not within extent"
The code will fail with the error: "src and dest data spaces have different sizes"
This example shows the selection that occurs if changing the values of the offset, count, stride and block parameters in the example code. This will select two blocks. 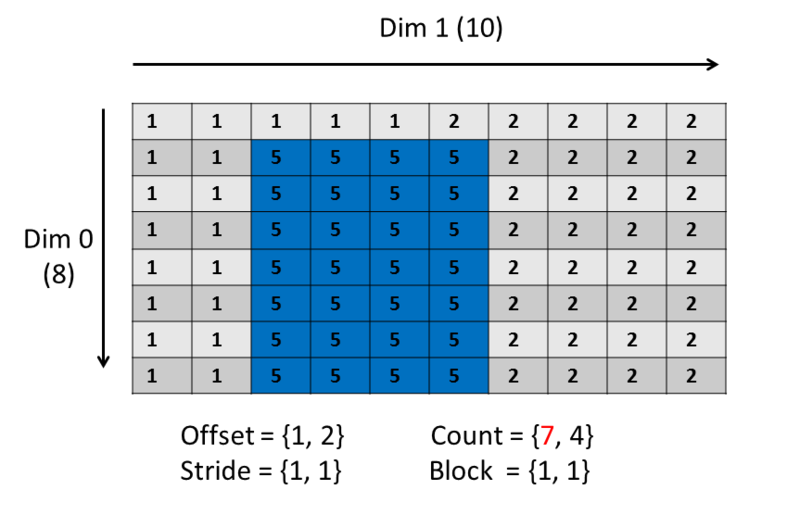 The count array specifies the number of blocks. 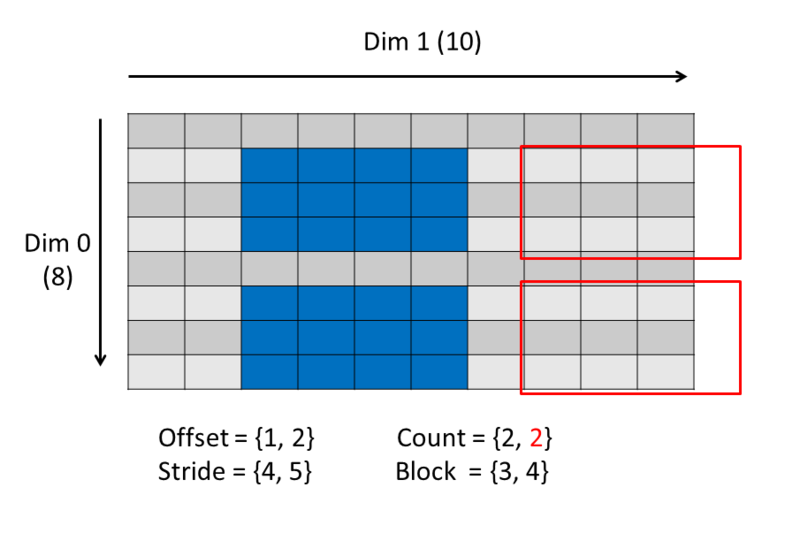 The block array specifies the size of a block. 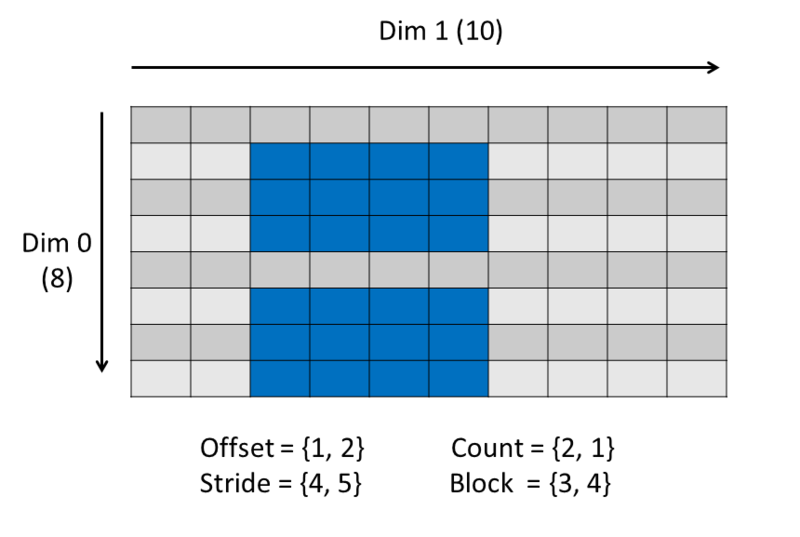 The stride must be modified to accomodate the block size. The selections above were tested with the h5_subsetbk.c example code. The memory dataspace was defined as one-dimensional. In addition to H5S_SELECT_HYPERSLAB, this example introduces the H5D_GET_SPACE call to obtain the dataspace of a dataset. If using the default values for the stride and block parameters of H5S_SELECT_HYPERSLAB, then, for C you can specify NULL for these parameters, rather than passing in an array for each, and for Fortran 90 you can omit these parameters.